By Shaunna Evans 45 Comments · This content may contain affiliate links. I am taking some time over our break to adjust some of the activities in our daily schedule. There are certain activities that just weren’t working out the way I envisioned them. One of these areas is our “Name and Letter Fun” time. Although the name activities we have been doing are working well, we haven’t been consistent about doing them daily. In an attempt to fix this, I put together five bags for each child. I used some very basic supplies that we had around the house. The kids will do each activity once per week. Each day one of the bags will be sitting out at the child’s snack spot. When we finish calendar time, the kids will sit and work with their name bag for the day while I finish getting snack ready. These activities are designed to take just a couple of minutes, and for the most part the kids will do them on their own. I will check their spelling and review as I give them their snacks. I plan to use these bags for one month and then create new bags. For this month I focused on letter recognition and putting the letters of their names in the correct order. They are not forming the letters or writing them for these activities. By placing each child’s materials in their own personal bags I was also able to differentiate a bit based on the child’s needs. One child will be working with all capital letters, and another child will be focusing on a capital letter at the beginning and lowercase letters for the rest of the name. 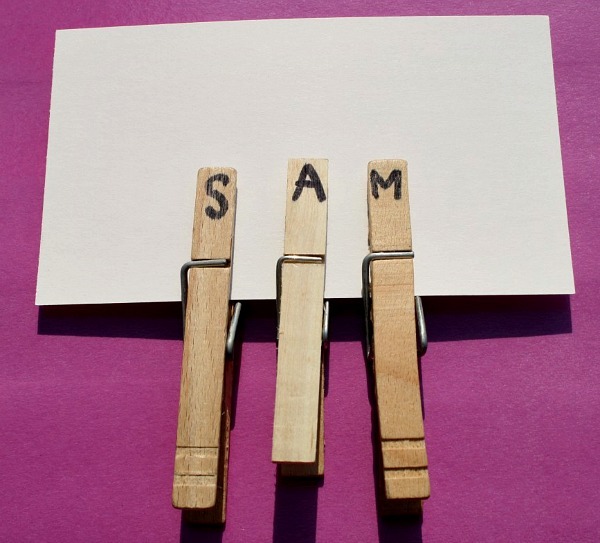 This simple idea from Creative Learning Fun is great because it also incorporates some fine motor practice as the kids pinch the clothespins to spell their names. You can add colored dots with the letters to the note card for kids who still need guidance in spelling their names or leave the note card blank and only include the clothespins with letters on them like I did here. It might also be fun to add a small picture of your child to the note card. Our second set of bags includes magnetic letters. This month I am only including the letters in each child’s name. Next month I will likely add a few additional letters to increase the difficulty a bit. We are also using the lowercase letters so the kids can recognize both. The third set of bags includes craft sticks with letters on them. I gave each child a different color of craft sticks in case we get them mixed up. For more ideas using craft sticks to learn name recognition visit our Pick Up Sticks Name Game Ideas. Another day we will use foam letters to spell the kids’ names. I had these ones on hand, but glitter letters or sandpaper letters would also be fun. I had these large glass beads that are flat on the bottom, and the kids love to play with them in our sensory bins or small world play. I decided to write letters on them and use them for name building this month. Did I tell you the activities were simple? Simple! It was quick to put these together, and having them all in one place ready to grab each day should help us fit in our name practice more regularly. I will update you with our new name activities in February, but you can also find more ideas now on my Learning Names Pinterest Board. What are some of your favorite activities for learning names? How do you incorporate them into your schedule? 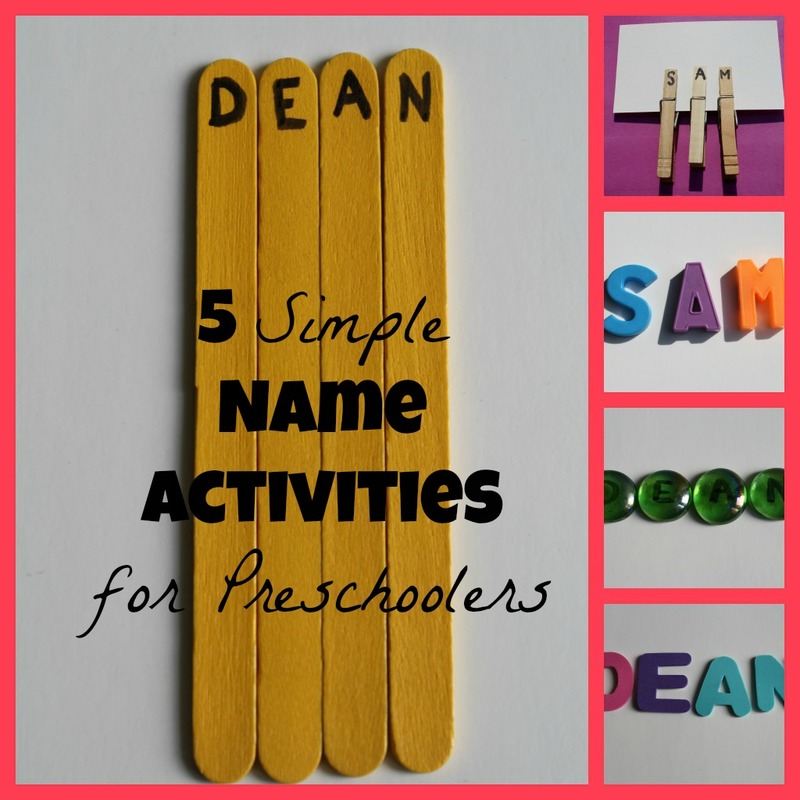 Personalized items can also be a fun and natural way for children to recognize their names. 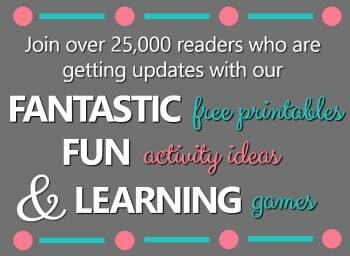 Frecklebox has a great selection of stickers, lunchboxes, notebooks, coloring books, story books, and more. Thank you so much for the activities ideas…. 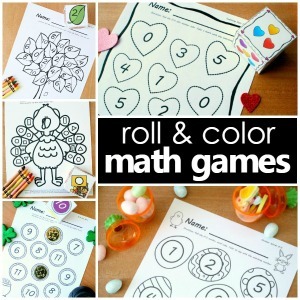 not only will I use them in my classroom, but also as a parent-child activity for the parents to do together with their child and take home… Thanks! 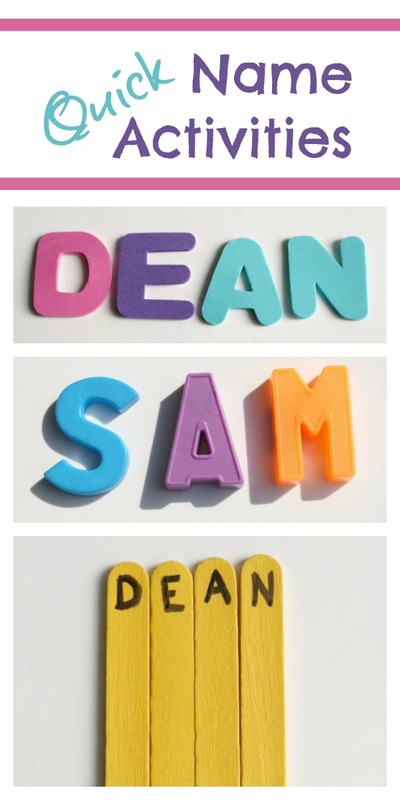 These are adorable and I will be using them this year, but my real question is this: are those actually your children’s names, or are you just a supernatural fan? I like your ideas for learning names. Just a reminder though, kids should be taught their names with only one uppercase letter at the beginning. I am a school teacher and we must do a lot of reteaching in kindergarten for kids who write their names with all uppercase letters. I have actually had a child say to me, “That’s not my name” when I show them their name with only one uppercase at the beginning. Thanks for your great ideas. I’m glad you like the ideas, Lorene. And you’re right. As a former kindergarten teacher I also received a handful of “That’s not my name” comments. However, I do find once kids have a true grasp of the alphabet, both upper and lowercase letters, they are able to easily understand and apply them correctly in their writing. I should have noted in this post that we use a variety of manipulatives, some in all uppercase because of the materials available and others beginning with a capital at the beginning. Thanks again for pointing that out. It is not re-teaching children, it is teaching. As a preschool teacher, I know it is not developmentally appropriate for a four-year-old to write their names using title case. Once they have mastered using uppercase is when they advance to using title case when writing their name. That is part of teaching, doing what is developmentally appropriate for each child and not expecting them to do more than that. This only causes frustration for the child. I totally agree with you. I also teach my preschoolers to write their name using capital letters. I do this because it’s much easier for them to print the letters in capital instead of lowercase,especially when thy are just learning to print their names. These are super activities! Thank you for sharing. If I may make one suggestion it would be to use a capital and then lowercase letters for the name so the children will not have to relearn it later. Thanks so much for the suggestion. Some materials require that I only use uppercase letters, but when it is an option I do use lowercase letters, too. The kids are learning both ways, and they are doing really well. Brilliant! Simple is best and this will be super fast for me to prep. I like the little bag idea too. So much of our homeschooling is done while I’m making snack or cleaning up from snack! Thanks! The bags have really worked well for us. And because they are using them just before snack, they have something to keep them engaged even if I take a little longer preparing something one day. They usually begin talking about the letters or engage in some other discussion or play related to the toys, and that gives me extra time if I need it. Glad you like them, and thanks for pinning! Preschoolers love learning their names. This is a great list. Thanks! I agree. My daughter loves learning her own name and everyone else’s, too. I think it is such a natural way for kids to practice recognizing letters and beginning phonics skills. I am glad you like the list, and I appreciate you sharing it. These are great. It’s something that I’ve got on planning for this year with my youngest. Thank you also for linking up to Tuesday Tots and just letting you know that I will be featuring you this week over on Rainy Day Mum. I am so glad that you can personally put the ideas to use. I hope they work out well! I really appreciate the feature. Thank you so much! These ideas are great! I especially like the clothespins and the popsicle stick ideas. Thanks for sharing! Lovely ideas for practicing names. Thanks for sharing at the Sunday Showcase! So glad you liked them! Thanks for stopping by. Thanks for the inspiration! I have been thinking about adding a center in my classroom where they can spell each other’ s names- now I have ideas of what to use! 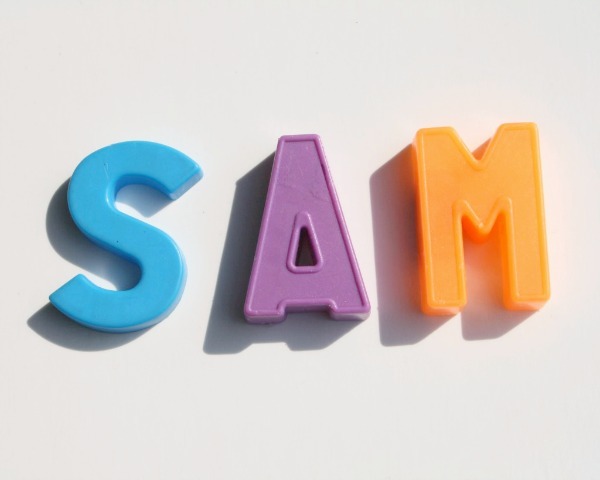 For those with younger children, they can begin by matching the letters in their name. I write it on a card and then give them small cards with individual letters on them for them to match. That is a great point. I still keep their name cards with our materials. They know that they can use them as a guide if the want to. It is exciting to see them grow in independence with the activity and choose not to use the name cards anymore. thanks for sharing these invaluable ideas. I have done this with small flat stones, foamies & paper squares. I send home buddy-bags with small activities to stimulate parent-child interactions & learning. 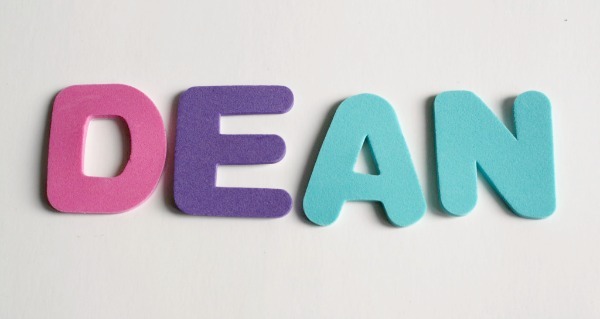 Your ideas will provide inexpensive resources for them to practice, the one thing they will own for the rest of their lives – their name, and if a piece goes missing, its easily replaced, when they finish with each different type of resource i’ll have them stick it in their workbook. I run a FDC service. I am so glad the ideas were helpful. 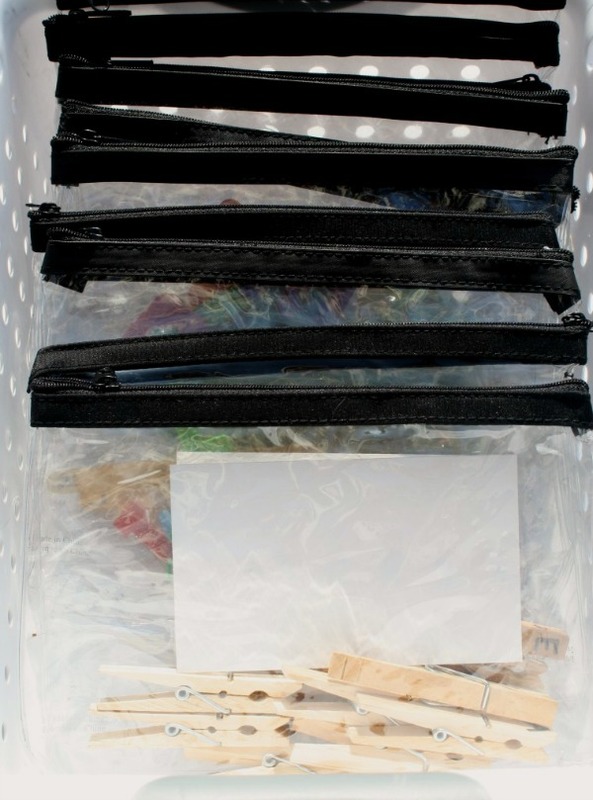 I used to use something like your buddy-bags when I taught in the classroom…great way to help parents connect with their kids and help them practice at home. That is also a good point about it being easy to replace missing pieces. These are really great ideas! 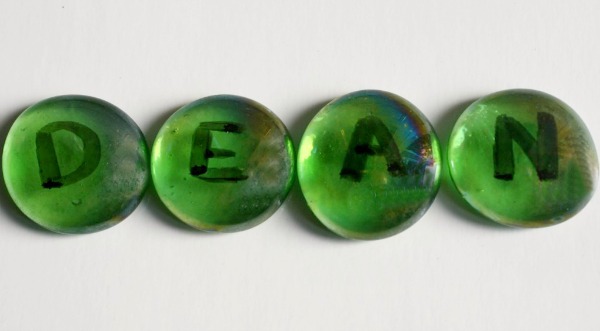 I have a post to make a whole alphabet with those glass beads. http://www.momshavequestionstoo.com/flat-marble-alphabet/ My kids love their “flat marble alphabet” and we use it for lots of activities, including name practice. 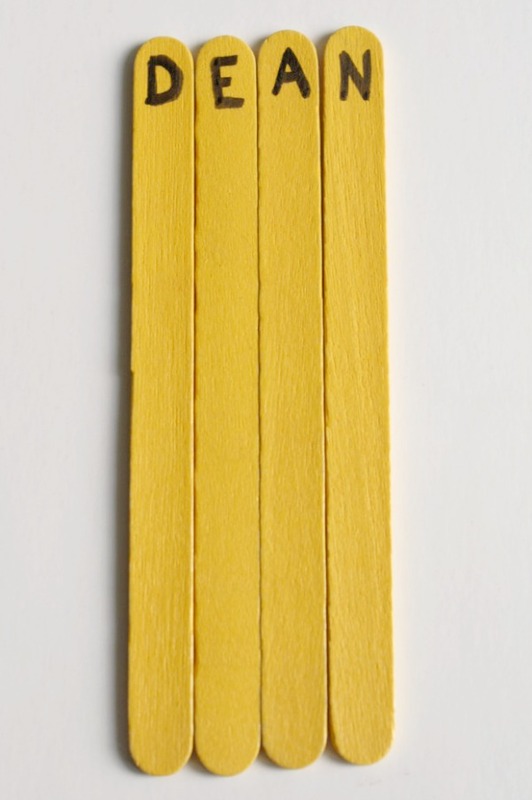 I am excited to try the popsicle stick idea, too. Thanks! I love your flat marble alphabet! I hadn’t seen it, but I pinned the tutorial so I will remember it. I just used a permanent marker to write on my beads (waiting to see how well it holds up), but yours are beautiful. That is some amazing set of ideas. Thank you for sharing.. I am thinking of doing this with my son as well. And it is so nice that I can do them easily as well with little preparation. I am so glad you like the ideas. I hope they work well for your son. I plan to share five more activities that my kids will use in February. Just wanted to let you know I will be featuring this post on Mom’s Library this week! Come check it out on Wednesday! Oops! It should be http://www.lifewithmoorebabies.blogspot.com Guess i got in a bit of a hurry! Thanks so much for the feature, Ashley! I will definitely check it out and share on social media. I’ll need these in a year or 2 for my little man. Thanks for posting! These are great ideas! My mission for this year is to get my 3 year old to learn how to spell her name so this post came at the perfect time for me! Thanks for sharing!!! Thanks! I am so glad the ideas are relevant to you. We are working on the same goal for the year, so I hope to add five new activities each month to keep things fresh and progress from spelling to writing as my kids are ready. Cute and easy peaty idea! Thanks for sharing! Great Ideas! My daughter can recognize her name when she sees it, but I’m in the process of teaching her how to spell her name with manipulatives such as magnetic letters and alphabet tiles..loved the glass beads and popsicle sticks idea since I already have them at home…another idea….we could use scrabble alphabet tiles as well Thanks for the post! Thanks! I am glad you found the ideas helpful, and I tried to use materials we already have on hand, too. I like the idea of scrabble alphabet tiles. I may have to include a variations of that in next month’s activities.